"Hiya, Sweetheart! You stayin’ out of trouble?" David Hoffman prepares to take on Banking Issues Tuesday October 27, 2009. David Hoffman is reminding you that today we’ll be marching with other concerned citizens to let big banks in Illinois know we’re fed up with their reckless spending and greed. 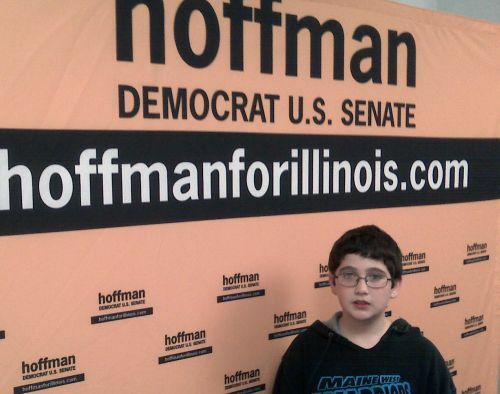 We’ll also be spreading the word about the campaign to make David Hoffman the next Democrat Senator of Illinois. 11:00 a.m. — Sheraton Hotel 301 E. North Water St. The Hoffman campaign will be handing out flyers to engage potential campaign volunteers. Make sure you take the time to show up, fix your government. Pictured is David McDonough, “kids for David Hoffman and better a world”. Photo by Patrick McDonough.